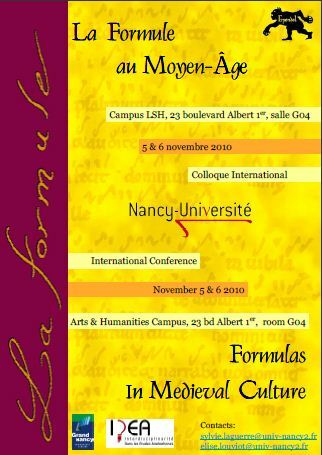 For the 2012 Conference on Formulas in Medieval Culture, click here! News: The book based on the proceedings of the conference will soon be available at Brepols. ‘Formulas in Medieval Culture’ was the continuation of a reflection begun by the Medieval Studies research axis of IDEA in 2008, with the conference on ‘Formulas in the Literature, Civilisation and Language of Medieval England’. This earlier conference brought together sixteen scholars and was highly enriching, but it also forced us to recognise the limitations of the terms we had set for ourselves: how can we speak of a phenomenon such as the ‘formula’ within the strict limits of English Studies, when the question is reflected in the culture of all medieval Christendom? For what reason should we evoke Beowulf and Chaucer, but not Chrétien de Troyes, when it is undoubtedly the two latter bodies of work that have the most in common? And what should we make of all the Latin texts of the period whose relation to a given national context is difficult to determine and often not highly pertinent? Such reflections led us to conceive of the idea of a second conference on formulas which would encompass all of the Middle Ages and thus address the question of formulaic expressions on a more pertinent scale. This second conference on medieval formulas was twice as large as the first, bringing together more than thirty participants from six different countries (France, the United States, Switzerland, Germany, England and Belgium). With the possible exception of theology, all the major disciplines of medieval studies were represented: literature, linguistics, history and art history, epigraphy and paleography and musicology. Although France and England were the most frequently evoked countries, other areas were also discussed: the Netherlands, Wales, Germany and Italy and even Byzantium. Amongst the questions posed during the conference there was, of course, that of the precise definition of the formulaic phenomenon: does it suppose the existence of a specific series of words employed in similar contexts by different ‘authors’ or can we take into account thematic networks without strict formal recurrences, or even repetitions that are limited to a small group or to a single person? Another major question was how to determine the ways in which different sorts of formulas were meant to be received: do they become void of meaning with overly frequent use or, on the contrary, does such frequent use load them with all the connotations of the multiple contexts in which they are encountered? The subject of medieval formulas attracted a number of musicologists and we thus decided to give a strong musical dimension to this conference. Following a panel devoted to Gregorian chant, we had the pleasure of hearing Christian-Jacques Demollière, Director of the Center for Gregorian Studies in Metz, present the evolution of Gregorian chant from formulas that developed out of Frankish and Roman musical repertoires. 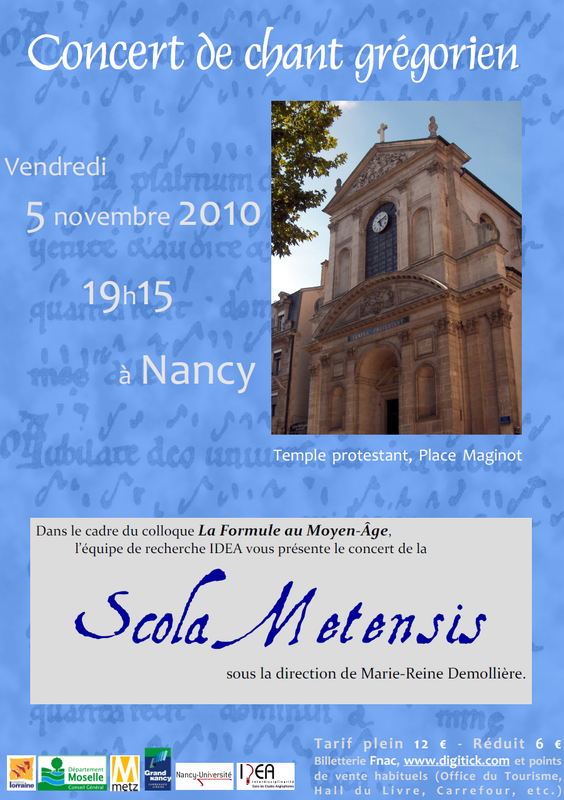 The conference also included a concert of Gregorian chant by the Scola Metensis, which took place at the Protestant church in Nancy. Although this concert was organised as part of the conference it was open to the general public and thus gave us the chance to share our passion for the Middle Ages with a larger audience. The success of this conference encouraged us in our desire to pursue this very rich vein of research in medieval studies and to renew our discussions of medieval formulas in 2012, and then again every two years thereafter for as long as the theme proves to be the source of fruitful scholarly exchange.